It was a small town by a small river and a small lake in a small northern part of a Midwest state. There wasn't so much wilderness around you couldn't see the town. But on the other hand there wasn't so much town you couldn't see and feel and touch and smell the wilderness. 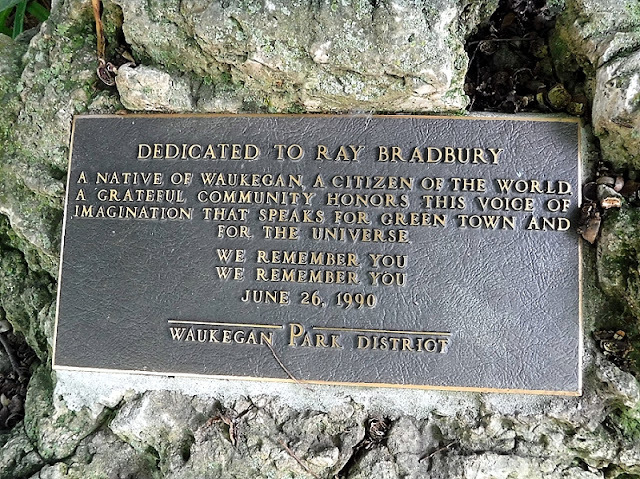 September 27, 2016 — This was a big one for me: Waukegan, Illinois—the hometown of Ray Bradbury. But it was more than just his hometown, more than the mere place where he was born. It was the very geography of his imagination. The place where so many of his stories were set. So many of his characters lived. On his pages, he rechristened the city Green Town. 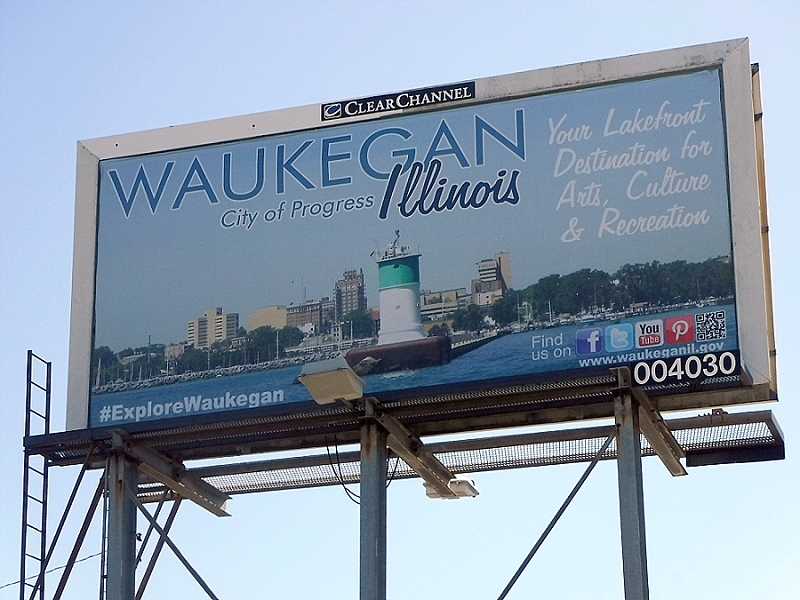 And I was going to see it all, both the real Waukegan and the fictional Green Town. We’ve got a lot to pack into this one, so let’s get going. We had pulled into town the night before, beat from a day in Chicago. Our first experiences with Bradbury’s birthplace were a few strip malls, a hotel interior, and a coyote that crossed the street in front of the hotel to disappear into the tall weeds. Later that night, during a thunderstorm…well, I’ve told that story already. First thing on our docket the next morning, though, was to revisit the park and its very special ravine to see it in the light of day. Ray Bradbury Park was originally named Powell Park in 1891, after a former mayor and seashell dealer who gave the land to the city. In 1990, they renamed it Ray Bradbury Park (Powell already had a second park named after him). 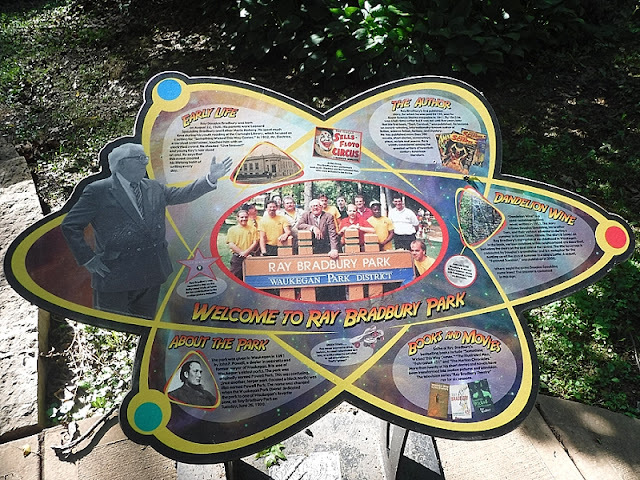 Ray Bradbury Park is small, has a playground, and is bordered on three sides by houses. 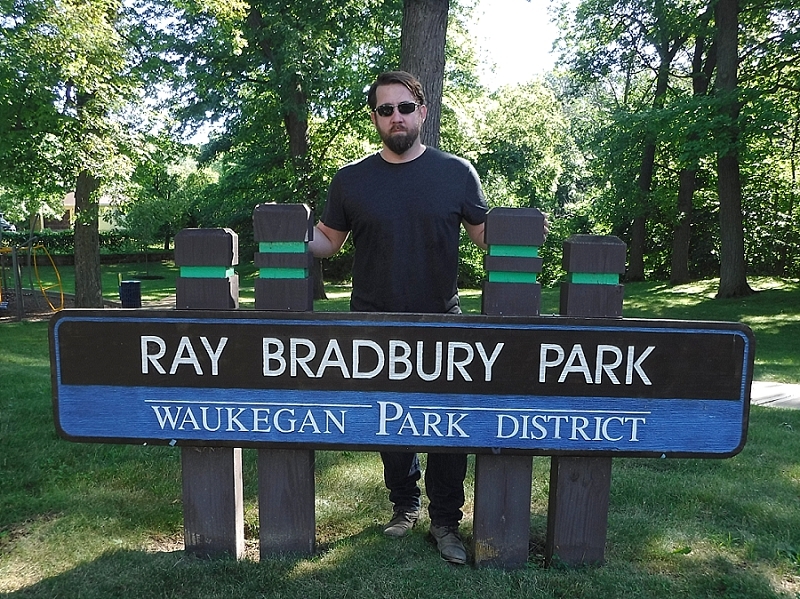 A low, wooden sign proclaims its name, a sign behind which Bradbury himself stood for a photo op during the dedication. In the night, the ravine had been a monstrous abyss. In the daylight, the creek and bridge and steep steps up the opposite slope looked welcoming. 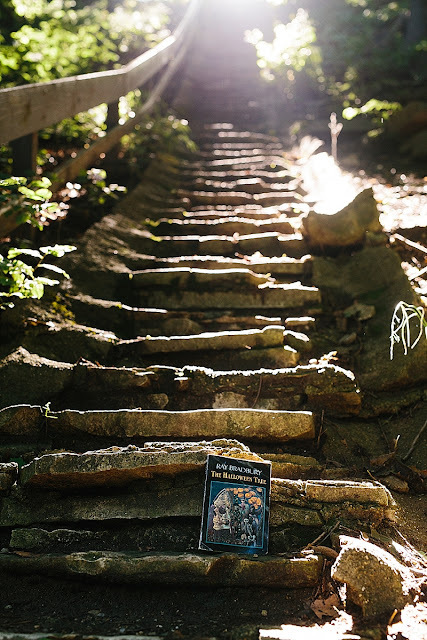 A small wooden sign at the base of the crumbling old steps read, “Dandelion Trail.” Looking up at them, I couldn’t understand how I’d made it up and down in the dark the previous night. In the rain. With smooth-soled shoes. Maybe I’d died there. Maybe I was a ghost that morning. Maybe I should leave the stories to Ray Bradbury. Maybe I should leave the park…and head to the author’s birth home. Bradbury’s house on St. James Street is only a block away from the park and right behind his grandparents’ house, which faces the intersecting Washington Street. There isn’t much to say about it. The house looks like a regular ole house. 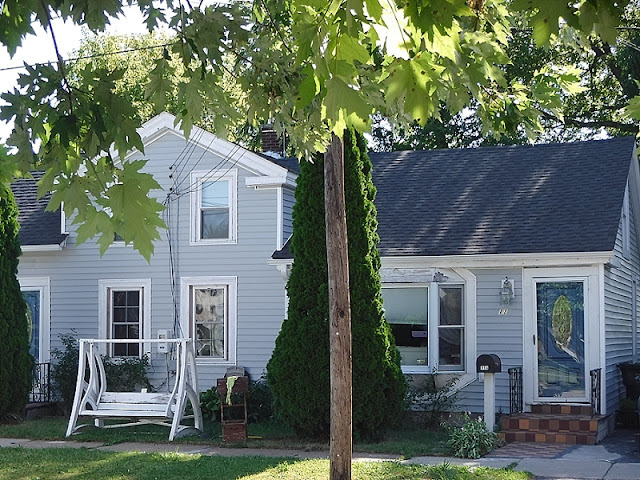 It's been subdivided into a duplex and has two tall tapering bushes in the front yard that rise past the roof line like green rockets taking off into the sky. Sorry the photo isn’t well framed. I had a hard time photographing the place due to a large white box truck parked directly in front of it. The most notable feature of his neighboring grandparents’ house for us Ray Bradbury fans is an odd window frame on the side of the house that in Bradbury’s day held stained glass. The young Bradbury would gaze through the window, fascinated by the way the colored glass distorted his view. He would later use these windows in stories like "The Strawberry Window" and "The Man Upstairs." We headed deeper downtown to see the two biggest impacts on Bradbury’s life and imagination: the local library and the local theater. 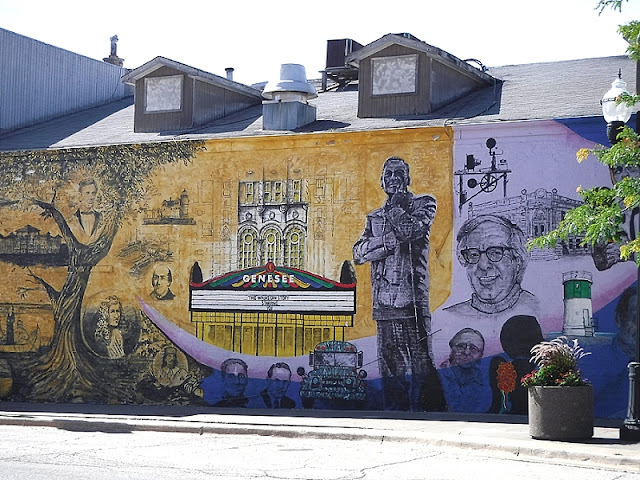 The Waukegan Public Library has a massive mural on its rear exterior wall that is full of children’s references, from Fat Albert to Harry Potter to the Headless Horseman of Sleepy Hollow. However, strangely, there’s only one Bradbury reference in the whole thing that I could find: A humble sign post labeled Green Town. But that wasn’t Bradbury’s library, anyway. This building was built in 1965, about three decades after Bradbury had become an Angelino. Bradbury’s childhood library is an abandoned but grand edifice a couple of streets over. 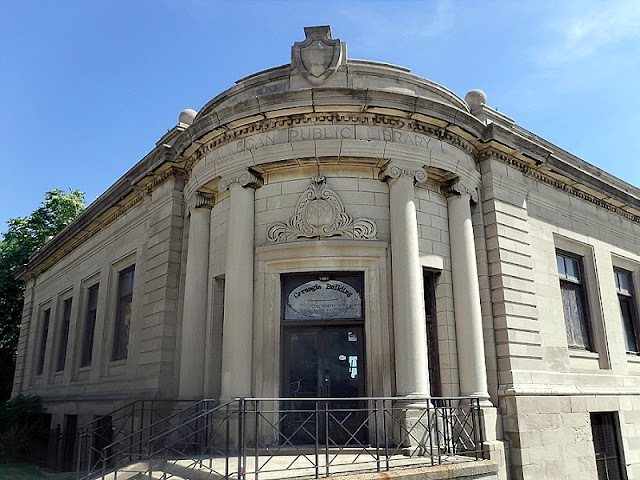 It dates to 1902 and is one of the famous Carnegie libraries. I could still see evidence of its past life in the windows, boxes of books and posters that encouraged reading. A group is right now attempting to transform the derelict building into a museum of sorts called the Ray Bradbury Playhouse of the Mind. 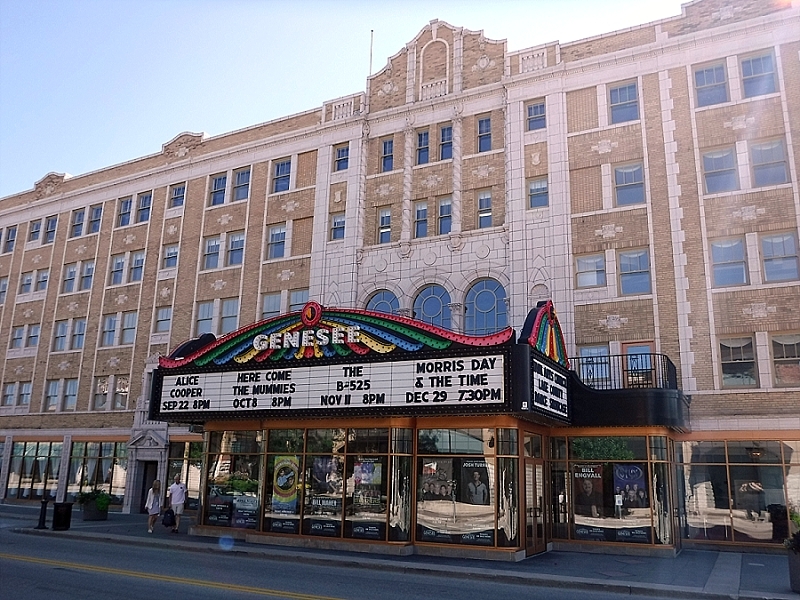 During Bradbury’s time, Genesee Street had two theaters across the street from each other, the Academy Theatre and the Genesee Theatre. At these movie palaces, he was fed a constant diet of monsters and heroes and villains. It was from here that he raced home to cross the ravine at night, with silver screen monsters at his back and his older brother hiding out ahead. The Academy Theatre building burned down in 2004, but the Genesee still stands and has been refurbished in this still-new millennium. On its marquee during my visit were adverts for Alice Cooper, the B-52s, Morris Day and the Time, and a mummy-themed funk band called Here Come the Mummies. Like, they all dress as mummies and jam. Everybody eventually finds their niche. Surrounding the theater are a trio of Bradbury tributes. Across W. Clayton Street, which runs alongside the theater, is a mural dedicated to Waukegan that prominently features Bradbury (although maybe not as prominently as Waukegan’s other famous native son, Jack Benny, who also has a bronze statue of himself in town). 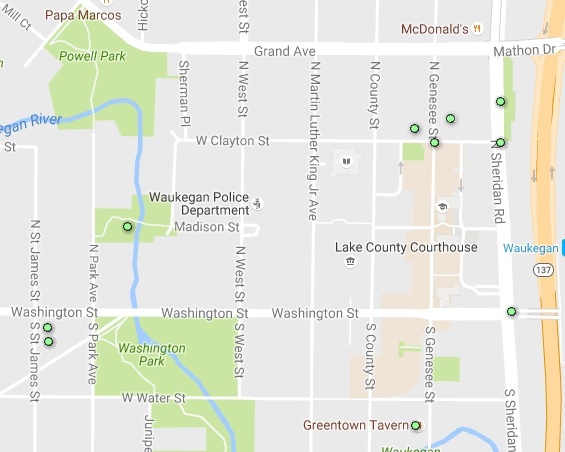 Directly behind the theater, across N. Sheridan Road, is an arc of bronze stars, each bearomg the face of a famous Waukegan-an. The center star goes to the pudgy, bespectacled countenance of good old Ray. Another mural behind a building adjacent to the theater shows a simple black train…with the number 451 painted on the engine, which makes me think of firemen shoveling books into the engine’s firebox for fuel. And that’s pretty much the extent of Ray Bradbury in Waukegan as of today. Before we left, we hit the municipal beach at Lake Michigan just as Bradbury would have done as a kid, and then caught a farewell lunch at the Green Town Tavern, which marked new items on its menu with a dandelion. The way I see it, Waukegan, Illinois, exists in three ways. The way it was during Ray Bradbury’s time. The way it is today. And the way Ray Bradbury envisioned it. 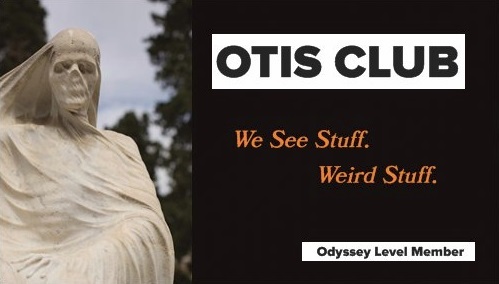 You can visit the latter anytime by picking up one of his books. You can visit the middle version by just traveling there. And the first, well, you’ll need a time machine for that one. Just don’t step on any butterflies when you go. Ray Bradbury Park: North Park Ave.
Bradbury Birth Home: 11 South St. James St.
Home of Bradbury’s Grandparents: 619 Washington St.
Carnegie Library: 1 North Sheridan Rd. Genesee Theatre: 203 North Genesee St.
Academy Theatre Site: 202 N. Genesee St.
Waukegan Mural: Genesee St. and W. Clayton St. 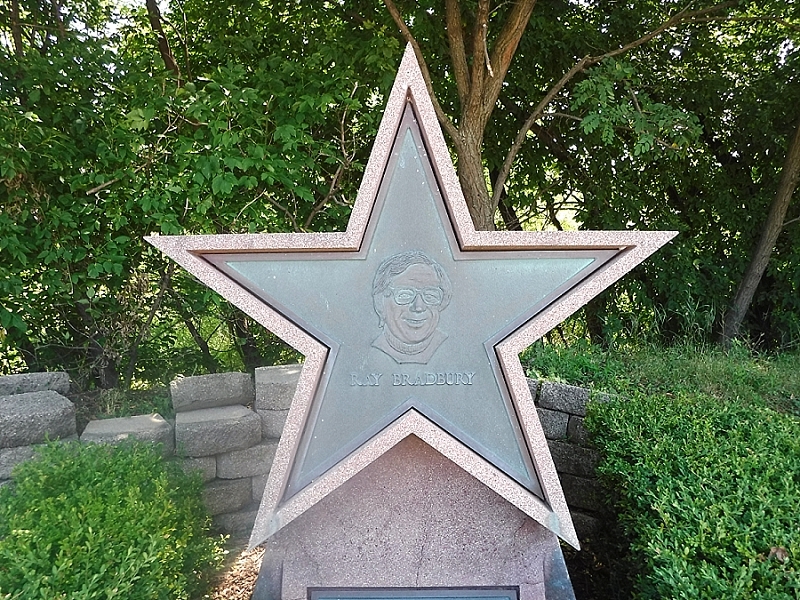 Walk of Stars: Haig Paravonian Park, N. Sheridan Rd. Train Mural: N. Sheridan Rd. 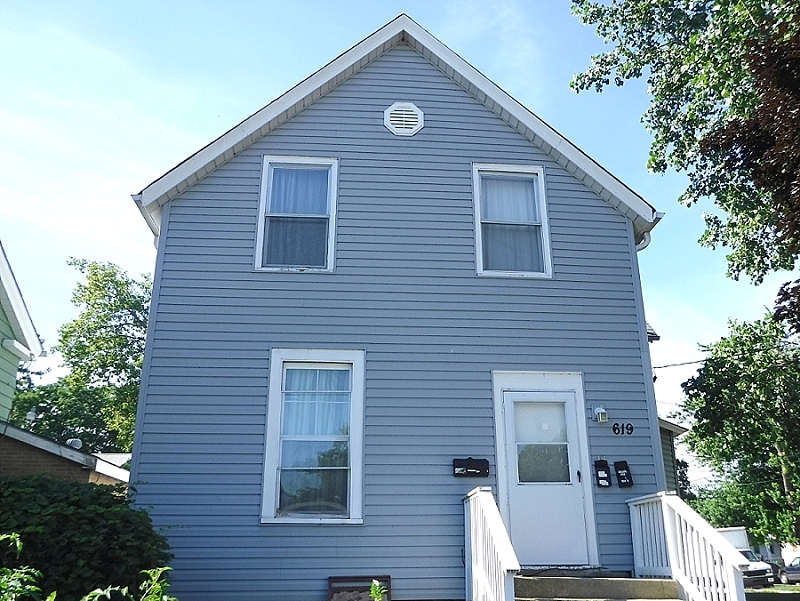 and W. Clayton St.
Green Town Tavern: 110 S. Genesee St.